Here's a helpful (hopefully) way to keep the various elements you need for the DBQ in your mind on exam day... T.A.C.O.S.! Obviously, "Synthesis" is not the only (or even easiest) way to get the final point on the rubric, but we'll get into that more later on. Describe an accurate historical context for a specific historical development or process.Explain how a relevant context influenced a specific historical development or process.Use context to explain the relative historical significance of a specific historical development or process. ​Below, you'll find a recording of my Live Lesson on Contextualization using the lens of Star Wars! If you remember nothing else from this lesson, try to remember those! Start off by watching the following video. While it was created by and for APUSH students, teachers, and readers, since the exams became aligned a few years ago the information is all still pertinent for your course. Once you've viewed the video, keep on scrolling! Responds to the prompt with a historically defensible thesis/claim that establishes a line of reasoning. Historically, the thesis has been one of the biggest struggle for students. And yet, the thesis is the most important part of the essays. This is because the thesis sets the tone for the whole essay and clearly outlines the arguments the essay will defend. Simply put, without a strong thesis, you cannot have a strong essay. So, how do you create a strong thesis? Well, all you have to do is follow these three easy steps! A historical defensible claim simply means is the argument you present in the thesis historical accurate. For the thesis, you must make a claim or an argument. This claim/argument is what you will be supporting and defending throughout the essay. So if your claim/argument is not historical accurate, or historical defensible, then you will not be able to support it with historical evidence. A line of reasoning is simply the reasons you present to support your argument/claim. Any good thesis will make a historical defensible claim/argument. A line of reasoning is- what are your reasons for making this historical defensible claim/argument. 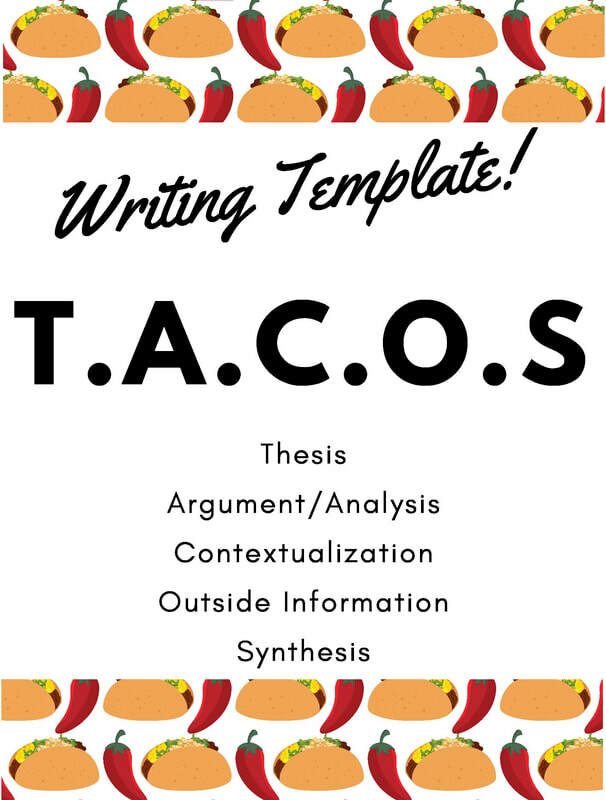 Typically, each of the reasons you provide in your thesis will each be addressed in a body paragraph. So the line of reasoning lets the exam reader know what your body paragraphs will be about. The prompt will ask you to evaluate the extent of a historical development. Your thesis must clearly state your evaluation of the extent of the historical development. One way to think about it: To what degree did the development influence the time period provided in the prompt? Still a big part of the revised DBQ, analyzing the "point of view" inherent in the documents will come in handy on exam day. Take a look at the worksheet below for some tips and tricks on accomplishing this often elusive task. Demonstrates a complex understanding of the historical development that is the focus of the prompt, using evidence to corroborate, qualify, or modify an argument that addresses the question. This understanding must be part of the argument, not merely a phrase or reference." While there are a fair number of choices there, some of which you should be doing as a good writer anyways (looking at you, #2), it is my personal and professional opinion that the best shot you've got at getting that point is #3 on the list above. We like to call it: synthesis. Mr. Richey has been kind enough to put together a writing clinic that I highly recommend. In last year's clinic, he covered the complexity point with the PowerPoint below. Take a gander, concentrating specifically on what he mentions about synthesis. ​Over the course of your work in this class, I'm sure you'll see this video often, but it really does a fantastic job of covering what all needs to be in an essay to earn the complexity point by way of synthesis. In this Live Lesson held on 12.6.14, Mr. Nissen (from WRHS) and myself gave an overview of the Document Based Question on the exam, as well as some tips and tricks. In this Live Lesson held on 1.10.15 at 10AM, Mr. Nissen and I recapped our main "Tips & Tricks" for DBQs and used S.O.A.P.S.Tone to analyze some documents. Click the button below to download!